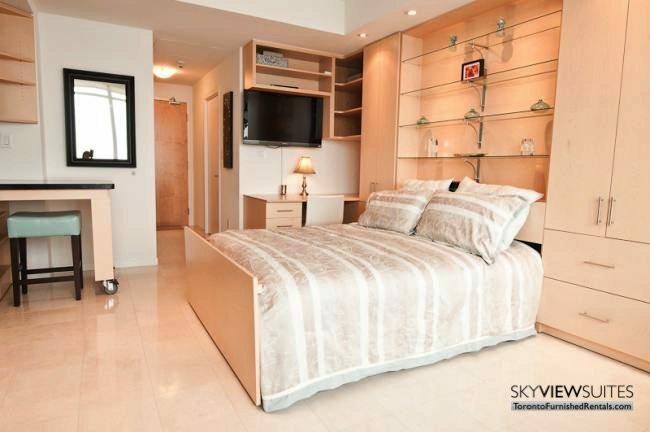 Toronto furnished short term rentals are becoming more popular for many people than hotels. This could be because they offer so much more than a comfortable bed and four walls. When you make your Toronto accommodations with us, we ensure you have a great, relaxing place to stay without having to pay an arm and a leg. Take for example this remarkable Maple Leaf Square structure in the middle of downtown. 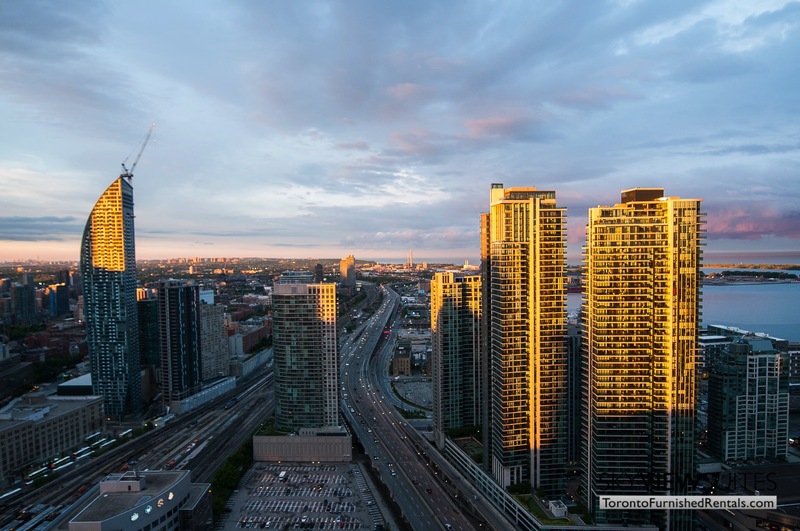 It is conveniently moments away walking to Union Station, the Air Canada Centre, the Rogers Centre, the CN Tower and the financial district. The position is perfect for sports fans, or business people travelling to Toronto. 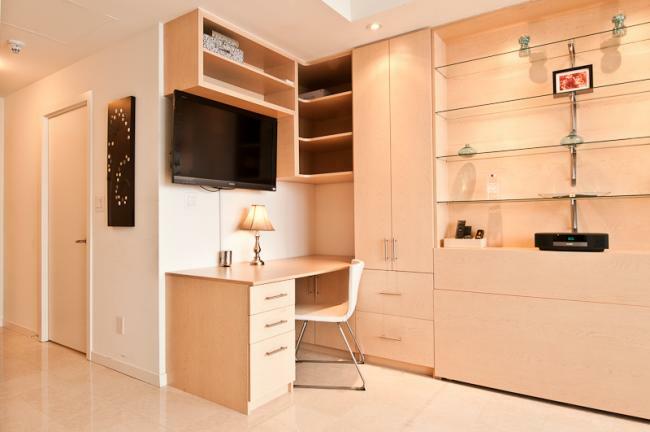 Studio apartments are sometimes synonymous with small; however, this unit is spacious in its own sense. There’s a fully functional kitchen with stylish stainless steel appliances and granite countertops which continue off to create a work space. 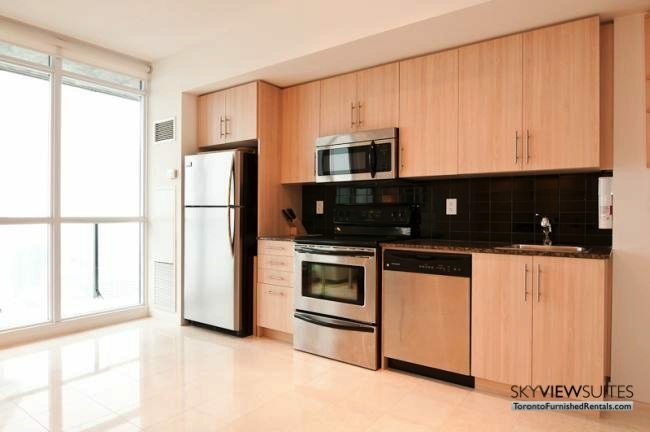 Enjoy the open concept layout of this unit; there is an inviting living space with enough legroom so you can move freely within the space. The suite is fully equipped and is furnished beautifully with contemporary and elegant decor. Snooze in the queen sized bed, or take a bubble bath in the wonderful three piece washroom. Take in the sights; the Maple Leaf building boasts a beautiful view of the CN Tower and the ever flowing lakeshore. Renters of this Toronto serviced apartment can enjoy the expediency of having stores and services at the bottom of the building including a Longo’s grocery store. There’s no longer a need for takeout every night, a quick run downstairs, and a little preparation and you can have yourself a gourmet meal. The Maple Leaf Square condominium provides 24-hour concierge for your security, an entertainment facility for movie fans, and a billiard room for those who enjoy playing games, common work spaces which are great for business people on the go, an indoor pool and hot tub for extra relaxation. Let’s not forget the fitness facilities- your workout routine does not need to be put on hold just because of relocation. For skincare lovers, a steam room is present, also, a 40 seat theatre room and an outdoor pool with landscaped terrace is on the premises. What’s even better is that there is an en-suite washer and dryer in this unit and for extra cleanliness there is a maid service which stops in bi-weekly to clean and restock your towels and linens. If that is not a big enough incentive, how about free wireless internet and cable TV in your suite? No more going down to the lobby to check your emails.